Age spots are one of the most common skin problems that people complain of, and are second only to wrinkles. Laser for age spots removal is a safe and effective option to get rid of unsightly marks and skin blemishes, and reveal a more youthful and rejuvenated glow. Whilst these spots don’t generally cause any harm, they are amongst the most definite signs of ageing. Why Opt for Laser Treatment? These spots vary in size and are caused due to years of sun damage. Occurring equally in men and women, they usually appear between the ages of 35 to 50 and are mostly seen on parts of the body that are most in contact with the sun, such as the face, legs, arms, shoulders, and hands. Although they are generally harmless, for some people these spots may sometimes promote abnormal cell growth which can cause the skin markings to become cancerous. In case you have a history of skin cancer in the family, making the decision to undergo laser treatment for age spots is a safe and effective way to remove these spots and ensure that they don’t reoccur. 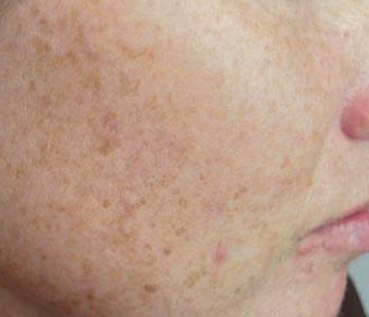 Another reason why laser treatment is recommended is that the majority of treatments for these markings are effective only in reducing the pigment in the spots – and that is, if they have any effect at all! If you want to permanently get rid of these spots and regain your healthy, youthful skin, laser treatment does this most effectively. Laser treatment for age spot removal uses a small handheld device to focus an intense beam of laser light on the skin where the spots are located. Typically, the procedure should not take longer than 30 minutes, excluding prep and waiting room time. Pain associated with laser treatment can range from mild to moderately non-existent, depending upon how sensitive the patient’s skin is. This type of treatment is an outpatient procedure, so routine activities should require only minor adjustments whilst you heal. After the initial session, you can expect a healing time of around 2 weeks. Once the procedure is done, the treated areas will develop a thin scab. It’s important that you don’t peel the scab off, as it will lead to scarring and hamper the healing process. Once the scab has fallen off naturally, patients will notice younger and spot free skin. Some patients whose spots are dramatically dark may need a second treatment session in order to remove all of the pigment from the skin. However, the majority of the patients are satisfied with the results from just 1 session. Similar to many other cosmetic procedures, age spot laser removal does come with a high price tag. On average, the treatment can cost about $700 to $1000 for each session. The cost also depends upon where you are having the procedure done. Laser treatment for removal of these spots is usually considered an elective procedure and is rarely covered by most health insurance policies. It is quite simple to make an appointment. First, you will have to make an appointment with your dermatologist to have him/her examine the skin for irregularities and to discuss your interest in having laser treatment to get rid of age spots. At this point, the doctor will tell you more about the basic procedures as well as any concerns they might have about your individual situation. If you decide to go ahead with the procedure, the doctor will help you schedule an appointment to have the procedure done either with him/her or with another dermatologist specializing in laser treatment. If blemishes are preventing you from showing off your glowing skin, laser for age spots is the ideal treatment option that will leave your skin looking youthful, healthy and rejuvenated. Speak with your dermatologist to find out if the procedure is a perfect fit for your needs.